So far so good. 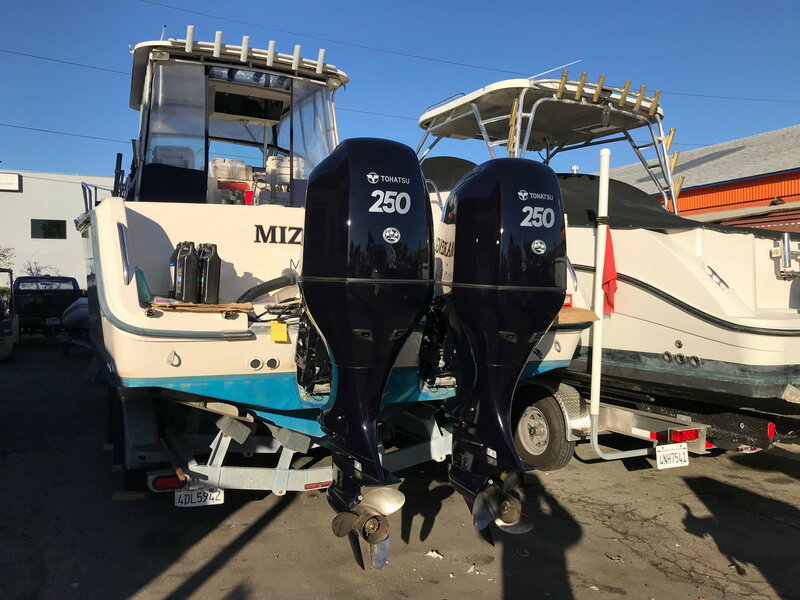 They are heavy but the boat performs well and is much quieter. The gas gauge isnt moving as fast! Now lets see if i can get 2000 hours out of them. Dropped it in the water and did the first two hours of break in. HighSpeedPursuit, Classic25, jbg108 and 2 others like this. Last edited by efx; 01-30-2019 at 09:46 AM. Good luck. They look sharp. I may take the stickers off and just say they are custom painted hondas. I cant believe that i got them 6 k less each than hondas. I don't think this deal will last. They sure are quiet and so far plane the boat as well as the 2 strokes. You'll be surprised at how much more juice the alternators produce over your old 2 strokes stators. I have a set of 2004 225 Honda’s. That have been great. They don’t have the fancy whistles and bells that some have. They are quiet, efficient and reliable. I do the maintenance on mine myself. They have not been back to a dealer since new in 04. HighSpeedPursuit, ByrdmanFL and Cruising123 like this. By any chance, do you change the oil via a dipstick pump? I keep the boat in the water and to get it out costs me $300, so i need to change the oil while the boat is int he water. i have looked at diptick oil pumps and that seems to be the way to go. I’ve always had Yamaha but went with a Tohatsu on my current skiff for a few application specific reasons. It has been a fantastic engine. Strong too. I have a 2013 Suzuki 70 that’s been good so far, a 2001 Yamaha 115 four stroke that keeps going and now the tohatsu. I would have stuck with Yamaha or gone for a evinrude G2, but they were 20k more ! I couldn’t pencil that out for how I use the boat which is island hopping in SoCal and summer kelp paddy fishing. All of this is less than 30 miles offshore. Most days are 70 miles rounds trips with an overnight stay at a mooring ball. How much do the 250s weigh in at each?? There’s no no way a Yamaha is that much better. Maybe not better at all! I always thought Tohatsu and Nissan were the same company. Is Tohatsu affiliated with Honda now? Does Nissan still exist in the marine engine business? The big motors are Honda's. Tohatsu and Nissan are the same except for paint and stickers. Tohatsu is partnered up with Mercury as well. All of the little 4 stroke Mercs are Tohatsu's. Each engine is 613 lbs dry. With oil, 8.7 quarts that adds another 15 lbs. They are heavy. I did an analysis to identify the delta between the new and old and it was 194 additional pounds. I placed 194 pounds on the transom to see what would happen. It did change the posture of the boat, but I think for the better. Time will tell, but I think the marlin 28, which is really 30’ has the beam to accommodate the extra weight hanging off the back. Last edited by efx; 01-30-2019 at 07:28 AM. I thought if I repowered I would call grady and ask about Glassing in part of the stern 2 foot notch to help float the extra 194 pounds. Dont remove the Tohatsu decals, they're a great quality minded company.....not like Yamaha that has killed the resale of so many Marlins. Last edited by Another Distraction; 03-21-2019 at 05:06 PM. Thanks guys. 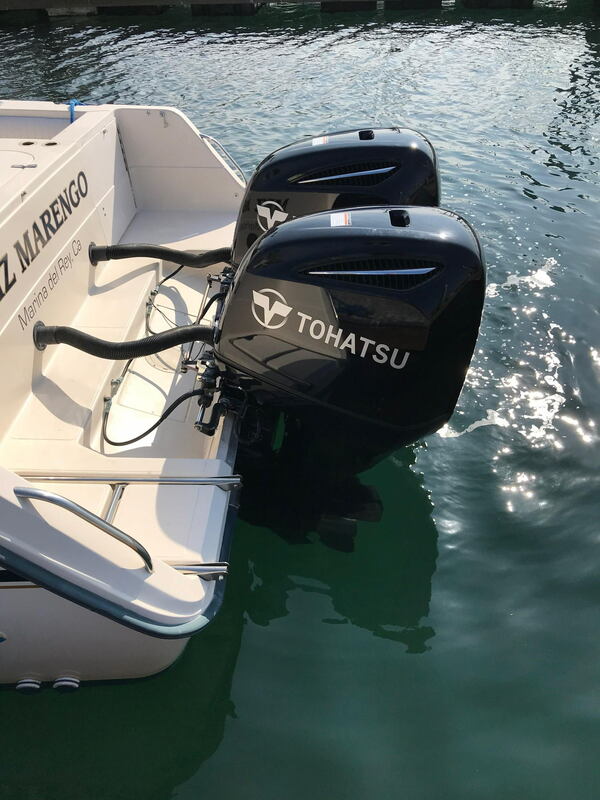 One nice thing is that tohatsu includes control cables, the binnacle, harnesses and key switch with the engines at no extra cost! That saved 1500 right there. What motors did you remove from boat?? I notice you kept the same center to center distance between motors.